SMS Broadcast has earned a reputation in the SMS messaging industry as the reliable service provider that enables individuals, businesses and organisations to send and receive SMS text messages from email’s PC’s and web browsers. 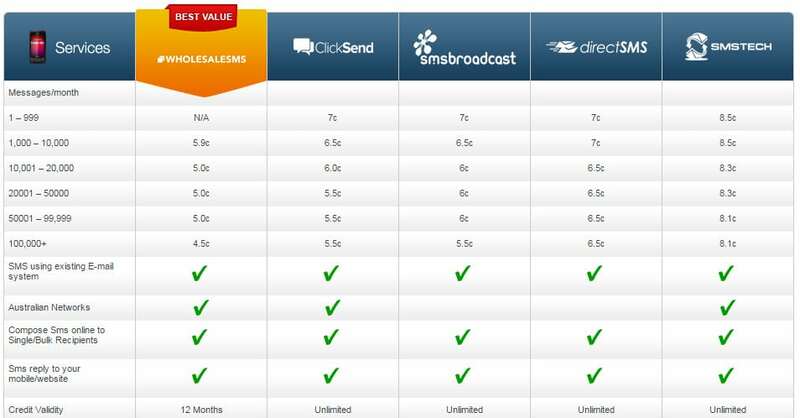 The Email to SMS Provider Comparison table provides a comparison of SMS Broadcast to other similar providers. Should I be using Email to SMS? Email to SMS is considered by many to be the easiest way to send and SMS from your computer without having to add functionality to an existing CRM system, log in to a website or upload bulk lists via CSV – simply open your existing email client and send your SMS as you would a standard email. Such simplicity in a service makes Email to SMS perfect for organisations simply looking to use SMS as an appointment reminders system or for occasional notifications such as parcel pick up or payment reminder. 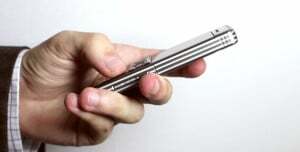 More importantly, most Email to SMS providers can also handle user-replies with ease. Giving your customers or staff the ability respond to your original SMS message opens up immediate two-way communication, invaluable when staff rostering or appointment reminders are being discussed. Unlike a web-based solution, you will need access to your email client. However if you’re after a simple, no-fuss solution that will deliver SMS as fast as your providers network allows then Email to SMS is the product for you. SMS Broadcast is a long established company offering online SMS services to individuals and businesses of all sizes throughout the UK. The company, which is based in Melbourne (Australia), was established in 2005 and has over 10 years experience in the SMS industry. SMS Broadcast has earned an reputation in the SMS messaging industry as the reliable service that enables individuals, businesses and organisations to send and receive SMS text messages from PC’s and web browsers. The SMS network supports a wide range of solutions for SMS including browser based message platform, Outlook Mobile Service, Email to SMS, Bulk SMS, Online SMS, SMS gateway, and SMS Marketing. SMS Broadcast delivers reliable and cheap SMS solutions to businesses and organisations, who needs to communicate fast and effectively with their customers, stakeholders and staff at any time through the means of email to SMS service. An Email to SMS Provider Comparison Table has been developed to see the variety of features offered by SMS Broadcast. Our SMS Broadcast review found their network supports a wide range of solutions from email to SMS text messages using browser based message platform, Outlook Mobile Service, Online SMS and SMS Gateway. It is able to send thousands of messages at once by means of email to SMS, giving the client the opportunity to distribute to a wide number of interested people in a very short period of time. It allows you to choose your replies to be managed by SMS Broadcast inbound system, go straight to your email, or directly to your mobile phone. Destination numbers can be typed in, imported from a spreadsheet or copy and pasted from Excel or similar software. You can also export numbers from an external program where you manage your contacts. This file can then be uploaded into providers address book or used for a marketing campaign. By merging names and other information into messages, this allows you to personalize these messages, improving engagement with your clients, stakeholders, employees and customers and thereby increasing the efficiency and effectiveness of your marketing or communication campaign. From the graphical chart below it indicates that SMS Broadcast offers the best range of features of all the other other Email to SMS providers. On a scale of 0 to 100, this company ranks an outstanding 98 as value for the features available. Other than ClickSend with a 91 all the other providers are in the range of 78 to 86 out of 100. Our Email to SMS UK Comparison table review of major email to SMS providers found that their prices were overall in the middle of the range compared to other competitors in the same field, whether it be sending out low number of text messages to high volume text messaging. It does charge a modest monthly fee compared to other competitors. Their virtual number costs are slightly more expensive each month but do not offer Keyword Response SMS service unlike some other providers. These SMS keyword applications are designed to send customized SMS replies or reminders based on the ‘Body’ of the incoming text message. When an SMS message is received at your mobile phone number, your application will fetch the ‘Body’ request of the message. Your application will then match the text of your incoming message with the keywords you have listed and send a reply. SMS Broadcast does offer unlimited credit availability, but so do all the other equivalent Email to SMS providers compared. It should be stated that SMS Broadcast customer care recommends optimum solutions at a cost-effective price, tailored to meet each requirement. They actively monitor the prices of the SMS markets and claim that they offer the low everyday prices for SMS messages as part of their price match guarantee if the client happens to find a lower price. Therefore, one needs to consider such charges against other SMS providers. SMS Broadcast delivers reliable Email to SMS solutions to businesses and organisations, who needs to communicate fast and effectively with their customers and staff at any time. SMS Broadcast provides state-of-the-art technology, maintaining great technical support. Customer care, quality of service and results are important to SMS Broadcast consistently strive to achieve 100% levels of satisfaction. The company delivers reliable SMS communication solutions that were specifically developed for every level of user to help save money and time. This makes them most extensive range of SMS solutions available for all types of business and organisations. Being an British based company it will provide support throughout the country on an ongoing basis which works on all British networks such as Telstra, Optus, Vodafone and Virgin Mobile. Some large British organisations from all different disciplines are using SMS Broadcast for their SMS delivery. One issue that is shown in the Email to SMS Comparison table is that SMS Broadcast does appear not to offers Uptime Service Level Agreement Guarantee or money-back uptime reliability, which is different from the other service providers. Uptime guarantees are attractive when used in a marketing pitch, but even the best guarantee won’t stop your site going offline. From the graphical format presented below using the range of 0 to 100 as a means of comparison, it can be seen that SMS Broadcast offers excellent reliability with a full 100 out of a 100 for its services. Although ClickSend is also at that high category klevel the other competitors have a lower rating. Our SMS Broadcast review found that they have key strengths in network offers and services more so than its competitors. It has a reputation and a reliable British support customer service. Their pricing policy is comparable to other competitive SMS providers and does offer an opportunity to provides a price match that may be cost competitive. SMS Broadcast has earned a reputation in the SMS messaging industry as the reliable service that enables individuals, businesses and organisations to send and receive SMS text messages from PC’s and web browsers. The Email to SMS Provider Comparison Table was developed to identify and compare the services and products offered by the range of Email to SMS providers through means of an independent yet well analysed SMS Comparison Table. This SMS comparison was created by a couple who have worked within the SMS sector and understand the difficulties faced comparing SMS companies and plans. The British couple no longer work with any SMS provider and have made these comparison tables using the information provided by the British SMS providers website. The information has been categorised into a simplified, readable, and easy to follow tabulated format so as to provide you with key information on key selection criteria such as message distribution costs, networks availability, composing online to single and bulk recipients, credit availability, service support and so on. It should be stressed that the information provided in the table and our SMS Broadcast review should only be used as a guide as prices and features may be updated at any time by the SMS providers’ websites without any prior notification. As the information on the table above comes from the authors viewing the providers websites and then copying key information, the information should only be used a guide as prices and features may update by the SMS providers website without warning. If you find any information on the table above or this website to be out of date or incorrect, please use the contact us form and changes will be made quickly. This Email to SMS UK Provider Comparison Table is provided for free to assist you, however a commission may be given from the provider’s site if you click through their website and engage their services. There are no forms of advertising on this site and the authors have made price and other key features the selection elements that have led to the recommendations made on the site.